So you are trying to lose weight? The mere idea of dieting conjures up the icky feeling of saying goodbye to your favorite foods… including baked goods. Deprivation is often associated with weight loss because it doesn’t seem possible to successfully lose weight while including some tasty baked goods. The concept of clean eating is changing the dialogue and the ingredients around what it means to lose weight. More importantly what it means to be happy and healthy. My philosophy is to give YOU the education and food resources so that your favorite foods aren’t off limits. 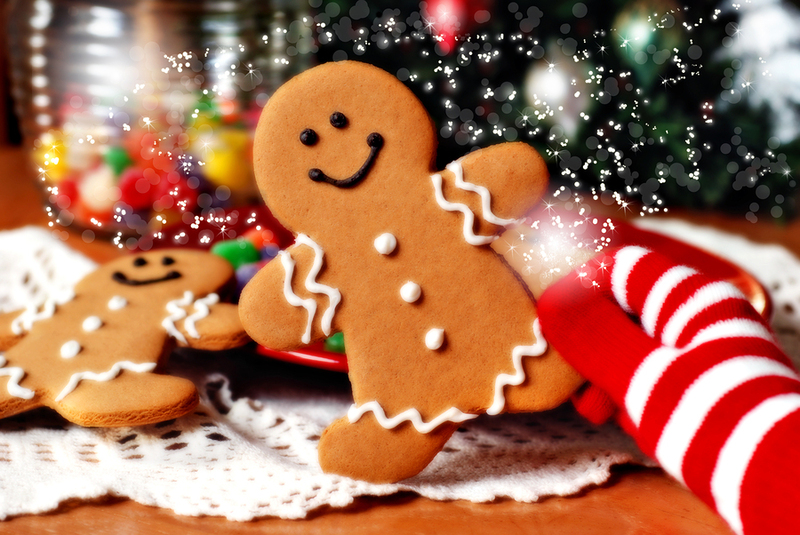 It’s my job to share the best quality ingredients for baking so that you can take part in the annual Christmas cookie exchange and eat them too… in proper portion sizes with ingredients that are nutritious and keep blood sugar levels stable. So what are some of those clean eating ingredients? Coconut flour is fiber from the coconut meat after most of the oil has been extracted to make coconut oil. Coconut flour is high in dietary fiber, protein and is gluten-free. The problem with gluten-free based flours is that most are devoid of fiber, causing blood sugar levels to quickly elevate. Depending on the recipe you can swap out the suggested flour and replace it with 30% coconut flour. In some cookie and muffin recipes you can replace the suggested flour for 100% coconut flour. Look for a coconut flour that is certified organic and has not been treated with sulfites to ensure best quality. Check out my recipe at the bottom of this post for my Grain Free Chocolate Chip Cookies using coconut flour. Coconut oil is a medium chain fatty acid said to support the thyroid gland and support metabolism. Most people swap out the oil in recipes for unsweetened apple sauce, thinking that the lack of good quality fats creates a ‘healthier’ ‘low fat’ recipe. The thing is, without the fat you are at risk for consuming a whole lot of carbs without much else. We know that when that happens our blood sugar levels soar. Coconut oil is solid at room temperature and turns to liquid at 78 degrees. It’s a perfect replacement for any oil, butter or margarine in recipes. It can also be used as a binder for things like granola bars or to sauté veggies in. Look for a coconut oil that is virgin and organic. Coconut sugar is made from the sap of the coconut palm tree. It is a granulated sugar that is caramel coloured and looks very similar to brown sugar. It tastes nothing like coconut as it comes from the flower bud of the coconut palm, not the coconut itself. It tastes a lot like a subtle tasting brown sugar. Coconut sugar can be substituted for white or brown sugar on a 1:1 basis in recipes. For every 1 cup of white or brown sugar in a recipe, use 1 cup of coconut sugar. This ingredient could be controversial and is to be avoided if you can’t tolerate dairy. If you are good to go then adding in Greek yogurt or choosing recipes that includes this high protein ingredient is great. Greek yogurt removes most of the lactose sugar, which is responsible for increasing the sugar content of regular yogurt. It’s also thick and creamy so it lends well to adding texture to muffins, dips and soups. Look for plain Greek yogurt. Avoid purchasing the vanilla, honey and fruit flavored ones as they have had processed sugars added. Baking recipes typically call for some sort of liquid. I like to use unsweetened almond milk in replacement for cream or cow’s milk. If you are a nut free home or doing some baking for school then try unsweetened coconut milk or hemp milk. 1 cup of unsweetened almond milk has half the calories of 1 cup of skim milk with less sugar too. Using almond milk won’t change the consistency and is much easier on the digestive system. Look for UNSWEETENED instead of the regular one. Preheat oven to 350° F. Lightly grease a baking sheet with coconut oil. In a medium bowl combine the almond flour, coconut flour, arrowroot starch, baking soda and salt. In another medium bowl combine the egg, vanilla, syrup and (cooled) oil. Add the wet ingredients to the dry ones and mix until fully combined. Stir in the mini chocolate chips. Shape the dough into 20 cookies, flattening them slightly onto the greased pan. Bake for 12-15 minutes, or until golden. Allow to cool on the pan for 5 minutes, then transfer to a wire cooling rack. Store in an airtight container in the fridge. How To Pick A Protein Powder For Smoothies – A Definitive Guide! After hours of comparisons weighing the pros and cons – here is the definitive guide to a variety of protein powders for weight loss! First, you have to understand why incorporating a protein powder can be vital to weight loss. Depending on your lifestyle (and workout routine), your daily amount of protein will vary. As a general rule, and for a sedentary lifestyle, you will require 0.40 grams of protein for every pound of body weight. On the other end of the spectrum, if you are strength training you will require up to 0.80 grams of protein per pound of body weight. Let us assume that we fall somewhere in the middle; working out about three times a week and at a moderate pace. In our case, we will need about 0.48 grams of protein per pound of body weight. For most Canadians, the amount of protein isn’t really the problem, with an average amount of 0.55 grams per pound of body weight. The problem is the type of protein! Protein powder is a great way to get the required protein without the saturated fat and cholesterol. Yay! Now, you might be wondering why we need so much protein. Well, every single cell in our body contains protein – so that’s pretty important. Losing weight by increasing lean protein uses a process called thermogenesis. Thermogenesis means that your body is using up stored energy, burning more calories, and it is using fat that is stored in love handles, muffin tops and saddlebags for fuel. Protein consumption can equal an extra 250 calories burned without the effort. Another bonus is that you will feel full so will have want and need less food. The effect of a high protein diet is that it will increase fullness for longer, causing you to eat less food on a daily basis. For this to work though, protein must be coupled with fiber. What is the easiest way to do this? SMOOTHIES! Check out the 9 green smoothies in my 48 hour green smoothie challenge. Now that we can agree that Protein Powder is awesome, it is time to start incorporating it into our daily routine. We feel that traditional whey protein is a bad idea because even though it may contain 20g or more of protein, less than half of it can be broken down and absorbed in the amount of time it is spent digesting. There is also an insulin spike associated with it, so it actually reduces the body’s ability to burn fat. Traditional whey powders have a similar impact on blood sugar to that of a marshmallow or soft white bread. According to the BioTrust website, it is possible to get the positive benefits of whey without the downsides. The website says, “the trick is to combine whey with other medium-speed and slow-digesting proteins such as milk protein and micellar casein, respectively.” Recommended here is BioTrust’s Low Carb Vanilla – with a whopping 24 grams of protein per serving size. Of course, sometimes less is more, so you can use ½ the serving size and still get a decent amount of protein. Whether you are allergic to casein or lactose intolerant, a vegan option will be best protein powder choice for you. The best choice for flavor, ingredients and bioavailability, is Garden of Life: Real RAW Vanilla. Made up of organic sprouted grains, seeds, beans and legumes- this protein powder has the full spectrum of essential amino acids and then some. It also has probiotics, a full spectrum of vitamins and minerals and digestive enzymes specific to protein. The price is great too at only $1.35 a serving. The Definitive Guide to Protein Powder! 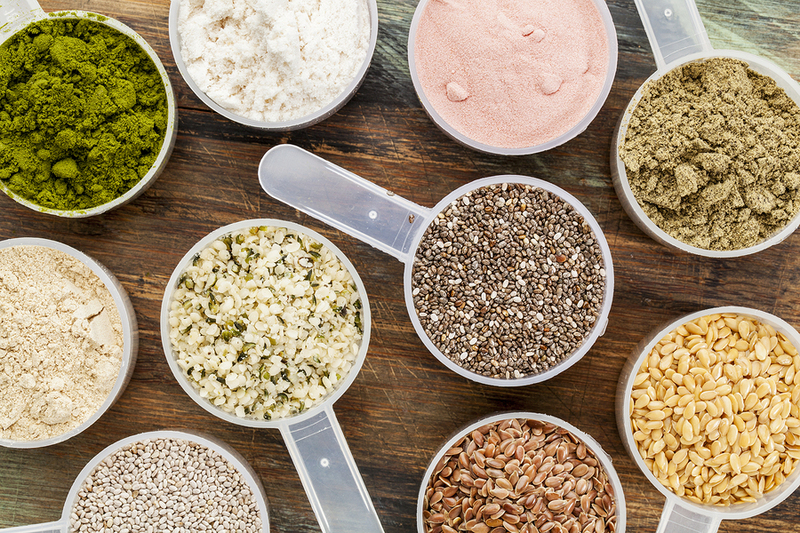 Our favorites are listed under each type of protein powder category and they have been broken down by price, ingredients and amount of protein. N.B. Soy is included because it is second in popularity to whey, but because of its effect on estrogen and has the potential to cause estrogen dominance, it is not recommended. The most common way to use protein powder is to add it to a smoothie, if this is the case for you make sure your smoothie contains a lot of fluid because protein powder can be dehydrating.Also, add fiber as this will help improve the feeling of fullness for longer – 1 tablespoon of chia seeds or ground flaxseed will add 5g of fiber. Most of all be creative, check out my recipe for a Creamy Berry Green Shake below. As the weather is getting cooler (-19 here in Orangeville today!!!) many people will start to move away from their smoothies and onto a warmer kind of breakfast. Oatmeal is a great choice and adding protein powder to your oatmeal is a great way to add a protein source to a grain. Start with 2 tablespoons of warm (not boiling) water or milk in a bowl. Pour a scoop of protein powder into the bowl and mix until smooth. If the consistency is too clumpy, add small amounts of water or milk until it mixes smooth. Once the oatmeal is cooked or warmed, add the warm protein mixture to the oatmeal and stir until blended. Enjoy! Combine all ingredients and blend for 90 seconds. Do you fall asleep as soon as your head hits the pillow but wake up in the middle of the night or too early and can’t fall back to sleep? If these describe some or all of your symptoms, you are probably suffering from the effects of stress and subsequent high cortisol levels. Stress and adrenal function affect sleep. Cortisol normally rises and falls throughout the 24-hour daily cycle, and is typically highest at around 8 AM and steadily declines during the day to reach its lowest levels between midnight and 4 AM. When under stress, the body responds by increasing cortisol that’s released from the adrenal glands. An acute rise in cortisol is not a bad thing because it’s the natural adrenal response to stress, like when you have to slam on your breaks in your car or when you spill your coffee on your laptop. The problem arises when the stress becomes chronic (long lasting), cortisol levels then stay continuously high and the body enters what is known as the adrenal resistance phase. This can cause inflammation in your body, it can affect your thyroid and metabolism, it can affect your serotonin levels causing depression, it can make you irritable, anxious and can affect your blood sugar leading to more of those lovely carb cravings. If this sounds like you, try taking some time to consciously relax before going to bed either by taking a long Epsom salt bath, an infrared sauna or some deep breathing or meditation exercises. One of my favourite apps is called Headspace, it’s 10 minute meditations you can do at bedtime or any other time for that matter. Don’t do any crazy exercise in the evening and try not to go to bed hungry, this will affect your blood sugar levels and only add to your sleep issues. Cortisol plays an important role in maintaining blood sugar levels around the clock. Low blood sugar sets off an internal alarm that disrupts sleep so you will wake up hungry as your body thinks it needs to refuel. If you want a snack after dinner that’s fine just make sure it’s a healthy one, none of those Halloween candy and chip leftovers. Make sure you finish eating 2 hours before you go to bed and focus on the healthy fats and proteins. If you are going to eat carbs, make sure they are the unrefined whole food variety like your high fiber fruits such as pears, apples or raspberries and combine them with a fat or protein. One of my favourite nighttime snacks is an apple cut up into slices with some natural almond butter spread on each piece – but remember, don’t overdo the nut butter, just half a tablespoon is a serving. The alarm clock goes off and you struggle to get out of bed. You hit the snooze button thinking just 10 more minutes. As you reluctantly roll out of bed you start thinking about your busy day and all of the things you need to do. Breakfast is the last thing on your mind as you reach for your first cup of coffee. One mars bar can’t hurt, can it? Are you able to stop at just one? You told yourself that today would be the start of ‘being good’ yet you are unable to focus because the cookies are just sitting there staring at you. Will power is no match for the smell or the feeling of pleasure that the cookie gives you. We all know sugar is the enemy… the toxic ingredient that is just as addictive as drugs, so why can’t you just forget about it and chose the veggies instead? Not only is sugar addictive, playing on the same pleasure centers in your brain as drugs, but it also perpetuates cravings that can be so powerful. Sugar overwhelms every cell in your brain. When you overload on sugar it alters parts of your brain that controls how much you eat. 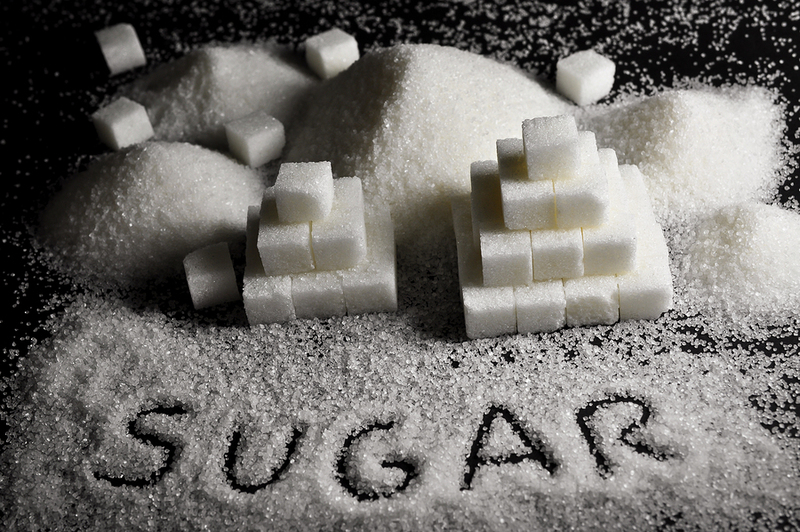 It’s been documented that we consume approximately 19 teaspoons of sugar per day. That equates to 285 calories. Now that you know this do you think it will be easier to quit the addiction? You get shaky, irritable, have headaches or feel emotional when you’ve gone too long without eating. If these symptoms occur just 1-2 hours after a meal then you have had too much sugar. Instead of feeling hunger you have a craving for something sweet. Choosing salad with chicken is NOT an option when the alternative is a bagel, pizza, pasta or a muffin. After a meal do you need something sweet? You have low energy in the middle of the afternoon and usually opt for a coffee or something sweet. You don’t seem to feel satiated or full after a meal of just protein, vegetables and a little bit of healthy fat. Sugar comes in a variety of forms and even the so-called ‘healthy alternatives’ are still just sugar triggering addiction. The white stuff hidden in a variety of other foods can set you off even when you think you are doing your best to avoid sugar. If you want to quit your sugar habit for good, start by trying out my 72 Hour Sugar Free Challenge. It provides you with a 3 day menu plan including breakfast, lunch dinner and 2 snacks so there’s no chance of you going hungry! Click here to download your free copy. If 3 days isn’t enough for you, email me at melanieg@wowweightloss.ca to take things up a notch and try out my 28 Day Eat Real Food Plan, this is a great way to stop your sugar addiction once and for all and lose some unwanted weight before the holiday party season arrives.